February and March make me dream of summer. I want ”summer” to sweep over me, leaving behind a vibe incomparable to other seasonal mind-sets. I have so many happy memories of summers past, and when these recollections come over me, I feel almost giddy with anticipation of good times ahead. While I have many good childhood reminiscences of long, lazy, warm days, there are some memories more outstanding than others; running through lawn sprinklers, endless games of hide ‘n seek (until our parents called us home), hot dogs on the grill with lots of pickle relish, double scoop-peppermint ice cream cones melting relentlessly down to my elbows, sitting in the stands at Dodger Stadium for a doubleheader on a Sunday afternoon and sweet, icy-cold snow cones. As an adult, summertime remains synonymous with kicking-back, however, at my house, relaxing demands good food be part of the equation. One of my favorite tastes of summer happens to be ceviche. And right about now, I need a taste of summer. With seafood poached in citrus juices and paired with fresh ingredients, this ceviche explodes with vibrant flavor and color. It’s irresistible once you start eating; you might want to make a little extra just in case everyone wants a second nibble. The ceviche is easily prepared a couple hours ahead of serving time and will be a memorable staple with your evening meals on the back porch. Try this dish with our Pinot Gris , it’s awesome together. 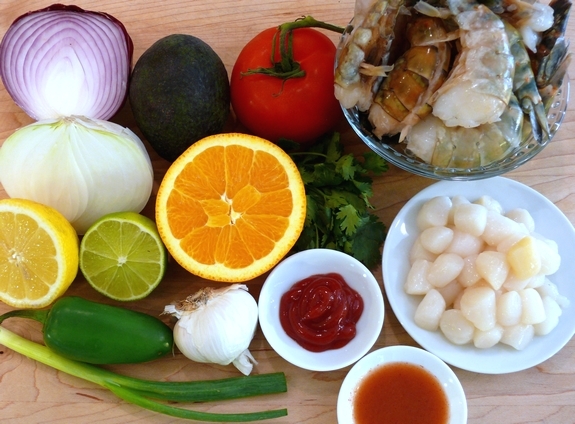 Here’s what you will need: Extra-large shrimp, bay scallops, fresh orange, lemon and lime juice, garlic, ketchup, white, red and green onion, jalapeno, olive oil, cilantro, tomato, avocado, hot sauce and kosher salt. Add ¾ cup diced tomato (seeded), ½ cup diced white onion, ½ cup diced red onion, 1 thinly sliced green onion (white and green parts), 1 Tablespoon diced jalapeno (seeded), 1/8 cup minced cilantro, 1 Tablespoon olive oil, and 1 Tablespoon hot sauce to the cooled citrus mixture. Add chilled shrimp and scallops stirring well to coat. When ready to serve, dip serving glasses into lime juice and then into kosher salt. Spoon diced avocado into the bottom of each glass and spoon shrimp-scallop mixture with juices on top. Serve immediately or chill up to two hours. Garnish with lime slices. Add orange juice, lemon juice, lime juice, ketchup and garlic to a medium saucepan and bring to a boil. Add shrimp and scallops; reduce heat and cook for 3 minutes. Using a sieve, drain shrimp reserving citrus juice mixture. Place shrimp and scallops on a plate and put in the fridge to chill. Cool down the citrus mixture by placing it in the freezer for 30 minutes or nested in a bowl of ice water. Add tomato, white onion, red onion, green onion, jalapeno, cilantro, olive oil, and hot sauce to the cooled citrus mixture. Add chilled shrimp and scallops stirring well to coat. hours. Garnish with lime slices. Oh, Cathy, I am dying here after seeing this ceviche! 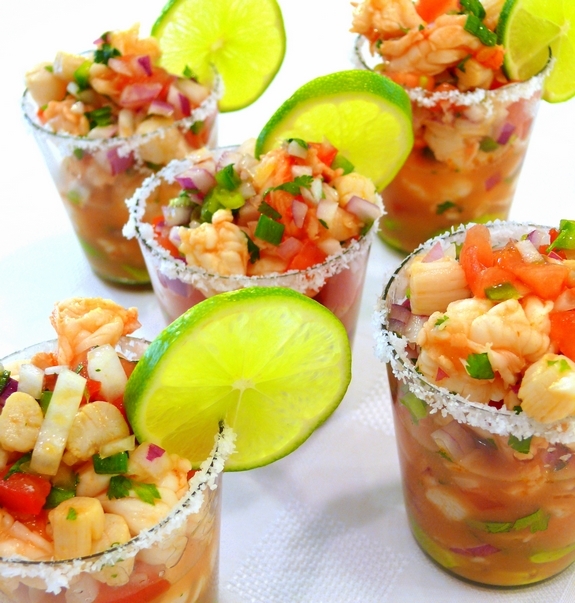 My leftovers are just not going to cut it for lunch after seeing your spectacular ceviche. I’m just imagining how divine this is, and doing the mental calculation on what I have already and what I need to buy. Wow, and thank you! This is just about exactly how I make it, only I switch out the tomatoes and katsup for apples. So delicious! Oh my, that looks delicious and beautiful! I love the addition of avocado. And the shrimp and scallops look absolutely perfect! That looks absolutely delicious, Cathy! This is so un-Oregon and so good lookin’. Takes me back to Texas. Think I will use canned tomatoes in the winter. I don’t see how you have time to start a winery, sell wine all over, cook for your family and publish a blog. Congratulations! And I thought i was the only one who put ketchup in my ceviche ;). I like the idea of cooking the seafood in the citrus juice. That has got to just add a ton of flavor. I also love your presentation – reminds me of those little pre-made shrimp cocktails that my Mom would buy in those little glasses. Thanks for sharing! Hey guess what!!! I love you soooo much that I nominated you for a Stylish Blogger Award. All you have to do to accept is visit my blog post “Stylish!? Who me?” and follow the steps on your own blog! Congratulations and happy blogging! I love the presentation! I am on my way to the bayfront right now to pick up some fresh fish. Thanks for the recipe. This looks soooo much like where I wanna be right now too. And yum. I wish I were braver about preparing raw seafood but it is hard so far from the coast or any fishmongers of any kind. gorgeous, and looks absolutely delicious. I usually shy away from any ceviche because I’m not a fan of fish, but this seafood version I can do! This looks amazing. You’re making me long for warmer weather big time! My mouth is watering. Those pictures make me want to RUN to the store right NOW. oh my god! I want this soooo badly! Love this! What a fresh dish to serve! Thanks for posting. Makes me want summer so badly. I was wondering if you ever cooked the shrimp and scallops without heat? 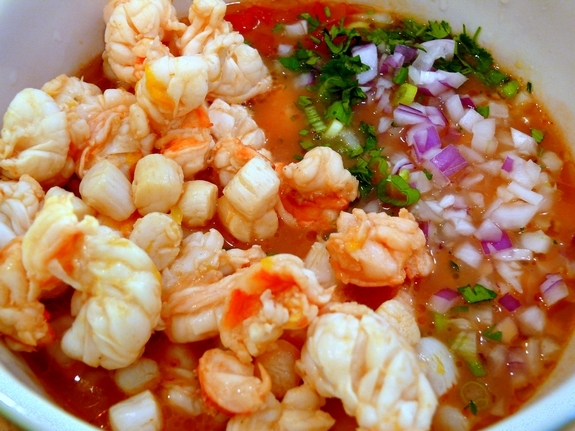 The ceviche I’m used to always used the citrus juice to cook the seafood… I would take the juice and just add the raw shrimp, fish, etc. and leave overnight in the fridge. This is chemically cooking the fish and preserving the oils and healthy benefits without leaving a “fishy” taste. I can’t wait to try this out, looks delicious!!! oh my. this looks absolutely delicious. i’ve never made ceviche at home but this makes me want to run right out and gather up all the ingredients. makes me think of good times in california. thank you! I made this tonight and my husband and I thought it was the best thing we ever put in out mouths!!! We didn’t put as much onions and it was perfect!!! Loved loved loved it and we leave in Arizona and make lots of Mexican food!! So glad to hear it!! Looks delicious !!! I’m definitely going to make this. 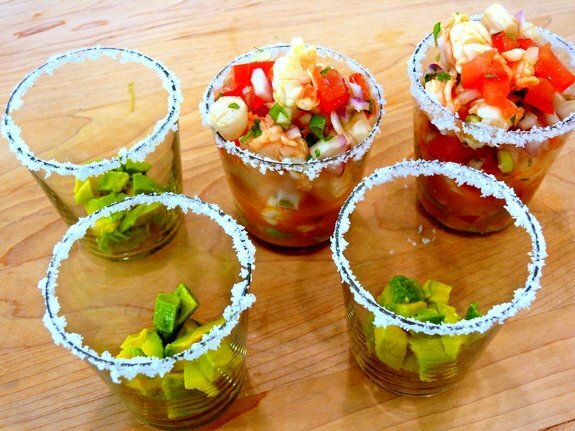 The glasses you used to serve ceviche are perfect. Where can I buy them? They votive holders, I ‘ve had them forever and have no idea where they came from. This looks so pretty and sounds delicious. I am planning to make it this weekend for a party but was wondering how many servings your recipe is for? It will make 5-6 per person servings. This is so fresh looking and tantalizing! Ha! I was just about to suggest a Pinot Gris with this dish! 🙂 Love the recipe. 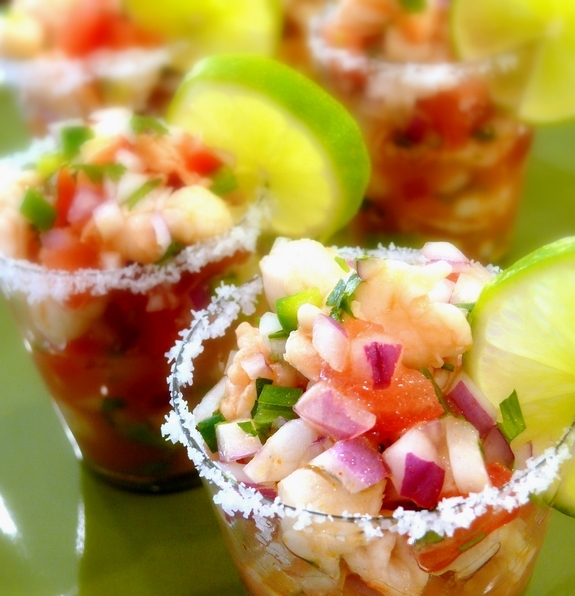 Ceviche is always a great idea and I love the dipping the rims in salt like margaritas! Partayyyy! I just made this and oh my goodness! Delicious is an understatement! I order this in my favorite restaurant but this is sooooooooooo much betterbecause I actually made it! Thanks for posting! This looks so good I have to make it. I have the awful “cilantro tastes like soap to me” gene so I’m hoping if I take Amy’s idea & add cucumber no one will notice it’s missing. Thanks! My friend made this recipe. Very yummy!!! How many servings is the recipe for. We are needing to make this for 14 people. Not sure if I should double the recipe or triple it? Have you ever added a splash of tequila? It would go great with the salt and citrus!! Sounds good to me. I think Patron…Silver would work. I made it tonight for my dinner party. Everyone loved it. It was one of my four mini appetizers! Thanks for a fab recipe! What brand of hot sauce did you use? I use Valentina. And I use more than called for. Before serving add fresh lime, hot sauce and salt to taste. I also add chopped cucumbers to the mix! Just wanted to let you know how much I appreciate this recipe! I’m from a family of Northern California abalone divers. I found this recipe about two years ago and made it with abalone. It’s become a family favorite. So fresh and light after years of eating fried abalone. Can’t thank you enough! Since then, I have enjoyed several of your other recipes too. Thank you! Thank you! So glad to hear it! Instead of scallops may I use halibut? This looks delicious! Would you happen to know the ounce size of cup these are served in? this is the best I’ve ever made… sooo good. I’ve made this for my husband birthday party, it’s all gone in seconds, some ask for more. Great recipe thank you so much!